Early Oct. 2004 brought a very nice message concerning an extensive Jenkins Glass collection from Patty Mattingly of Franklin, IN. Along with expressing her appreciation of having found our site postings on the subject, she provided us with an article which appeared some 38 years ago in the Indianapolis Star on March 6, 1966. The old newsprint has offered some obstacles to scanning, so we decided to re-type the information verbatim, believing viewers will benefit from the information provided. We find we can use the original heading, along with two photos from that newspaper for emphasis. Indiana's Sesquicentennial year is focusing attention on Hoosier products of the past and none are more popular among antique collectors than glass. In the history of glass in Indiana, one name stands out ----D.C. Jenkins. Two generations of D.C. Jenkins were prominent in Indiana glass production and they are both first recorded directors of the Indiana Tumbler and Goblet Company which made what is now known as Greentown glass. D.C. Jenkins, or “Old Dave” as he was called, was an experienced glass man who had migrated from Wales. He became the boss of the “pot room”. Young David C. Jenkins was made the manager of the Greentown factory. The firm enjoyed good management, a plentiful supply of natural gas and access over the Cloverleaf Railroad to a ready market. But there was unrest among the owners and according to Dr. Ruth Herrick in her book “Greentown Glass”, the firm was sold on Oct. 28, 1899, to the National Glass Company. Young Jenkins was one of the directors of the new company which owned 19 glass manufacturing plants. He had been a leader in the organization of the company which was patterned after the United States Glass Company, a larger competitive firm which Jenkins had been associated with at Gas City. But less than a year later, in 1900, Jenkins left National Glass to start a glass house at Kokomo, known as the Kokomo Glass Manufacturing Company. This was the beginning of “Jenkins Glass”. The factory burned in 1905 and was rebuilt in 1906 under the name D.C. Jenkins Glass Company. Two important patterns were produced at the Kokomo plant. J. Stanley Brothers, in an article in the June, 1939, Hobbies magazine, said they were designed by Auburn Long. They were Paneled Grape and the Dew and Raindrop-known as Pattern No. 50 in the company catalog. Brothers say the pattern dates from 1901. Mrs. Ethel C. Lorton, a schoolteacher living at Arcadia, is now doing research on Jenkins glass made there. Arcadia's “golden years” are considered by residents to be those associated with the operation there of the Jenkins Glass Works. Jenkins bought the old glass works at Arcadia in 1913 and produced glass there until 1932 when the firm closed its doors along with the bank there during the depression. During the years of operation, the firm produced a glass which, according to Mrs. Lorton, is being discovered as a 20th Century glass to collect and preserve. Many letters have been received from readers interested in the products of the Jenkins plant. A large amount of utilitarian glass was made at Arcadia. Manufacturers bought goblets and spooners to use as containers for their jellies and mustard. The firm also took advantage of a goldfish fad and produced a variety of sizes of aquariums. Soda fountain supplies, sundae dishes, banana split dishes and wine and beer glasses were produced as well as containers for Wrigley's chewing gum and Velvet tobacco. Mrs. Lorton said Arcadia homes were filled with the glass, but the owners did not consider it good glass. She said this was because the workers were allowed to take home the culls which often were inadequately fired and broke easily. Mrs. Lorton says it is impossible to separate the patterns made at Kokomo, Arcadia and at a few other factories as the molds were exchanged. 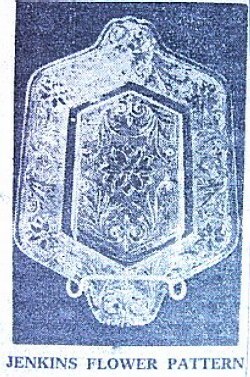 Carnival-type glass was dipped at Arcadia and engraved at Kokomo. The “colored ware” or “dipped ware”, as it was called, was not the quality of the earlier and true carnival glass. “The workmen did not like this glass, nor did they like to make it,” Mrs. Lorton said. “They said it was hard on their hands, clothes and tempers, and breakage was high”, she said. There is a possibility this glass may become a good collector's item as it was made only for a short time - about two years in the 1920's. It was all of a thin marigold color and the color was not even .Other items which will grow in value in a few years are souvenirs given by Jenkins, with the name “D.C. Jenkins” on them, when he ran for political office. 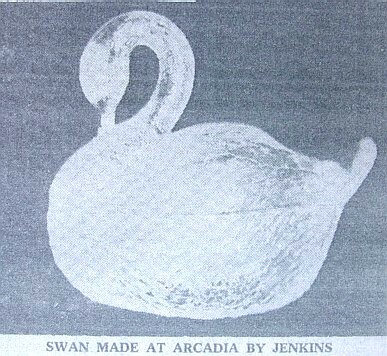 A favorite of Mrs. Lorton is a Jenkins covered dish in the form of a swan. A late pattern from Arcadia has been named “The Conventionalized Flower” by Mrs. Lorton. Jenkins did not give his glass names, only catalog numbers. The poor quality Jenkins glass found in Arcadia homes may also become collectors' items. They have “seeds”, or grains of sand, bubbly edges, “strings” caused by a cold mold, or other faults. Mrs. Lorton discovered that Jenkins gave every church in Arcadia barrels of his glass, but in recent years, the glass has been disappearing from the churches. Jenkins also gave to various clubs and institutions. Mrs. Lorton also believes many pieces made at Kokomo and Arcadia in later years were reproductions made from old molds. Her personal interest is collecting punch cups. She has two in the same pattern that bears out this theory. The design is distinct on one cup and on the other, part of the design does not show. Your labor for the Lord may be unseen and unheralded, but it is essential.